No cooking, no dishes, no worries: now that is relaxation! Maybe that’s why dining out is one of my favorite parts of a vacation. But when you are in an unfamiliar city, it can be a challenge to find the local hot spots. As a result, many folks sadly find themselves parked outside a local iHop, Applebees or some other national chain they’ve already eaten at a million times. Don’t make that mistake! I like to think vacations are times to explore new restaurants. To try new foods and enjoy a new atmosphere with new people-watching. And with this list of Anchorage’s local gems, I can guarantee you’ll walk away happy. Taco King – nothing fancy, but if you are craving some quality Mexican food then this is the place to go! 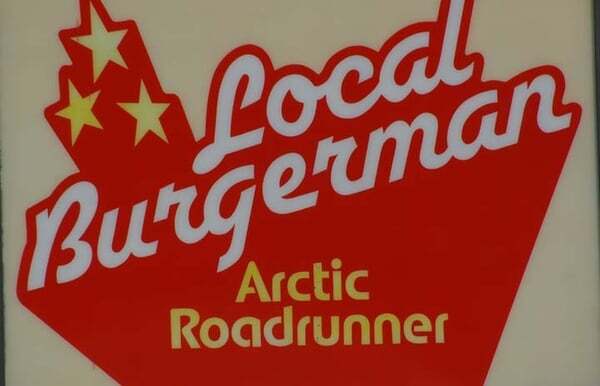 Arctic Roadrunner – if you are in the mood for a fabulous burger and famous onion rings, this is your stop. Moose’s Tooth. Amazing pizza and pub, this is probably the most popular restaurant in Anchorage. Bring your patience because you can show up at 2:00 in the afternoon or 9:00 at night (on a Tuesday) and there will still be a wait. Luckily they serve their own Broken Tooth brews to keep you happy while you stalk a table. It’s worth the wait. Bear Tooth. Same owners as Moose’s Tooth, and just as popular with the locals. You can visit their grill or theater. Both have an amazing atmosphere with fabulous food and brew. The theater usually shows $3 second run movies, except on Mondays when you can catch an artsy documentary. There is a bar in the back of the the theater, and every other row of seats has been ripped out and replaced by tables. It’s a great way to watch a flick while enjoying their gourmet pizza and brew at the same time! If you’re lucky, there might even be a concert scheduled while you’re in town. Humpy’s is a favorite downtown pub with plenty of fish and seafood on the menu. There are dozens of beers on tap, in addition to live music on weekends and Pub Quiz on Tuesdays. Fun stuff, and great for breakfast, lunch, or dinner. Snow City Cafe – the downtown hot spot for breakfast. If you want to dine out for brunch in Anchorage, this is the place to do it! I will list some of Anchorage’s nicer restaurants, but don’t bother to pack a tie. This is not a pretentious town, and casual attire is welcome in nearly all of our restaurants. Also, it should be noted that Anchorage has many fine restaurants that we have simply not visited, so there is much more to explore than the short list you see here! Orso – This is one of the finer dining places in Anchorage, and it has an impeccable reputation. Same owners as the Brewhouse (listed next) with a happening atmosphere, unique menu, and guaranteed good time. They make a point to serve fresh Alaska seafood daily, so enjoy! Glacier Brewhouse – This restaurant is located downtown, has great atmosphere, excellent food, and brews their own beer. It might fit better in the casual dining section – it’s a gem that can go either way. On the rare occasions when Clark and I have a date night, this is usually where we end up. Happily. Crow’s Nest – for dining with a view, we are told this is the place to be. Located in the Hotel Captain Cook, it offers views of Cook Inlet and the Anchorage city lights while you dine. You can expect local, French, and New American cuisine. Maybe you do need a tie here? Not sure, we’ve never been. But our friends rave about the place! Midnight Sun Brewery – cheers to the makers of my most favorite brew ever – the Sockeye Red IPA. Their motto is “Cold Beer for the Last Frontier.” They offer brewery tours, awesome food, and some fun specialty events. Plan to visit early, because they close at 8 pm. Bummer, eh? Whale’s Tail Bistro and Wine Bar – can you say self-serve wine bar? This bar is in the Hotel Captain Cook. It should be noted that the Cook has many establishments that come highly recommended, but this is the only one I have personally visited. For all the Cook dining options, as well as more about the Whale’s Tale, click here. It should be noted that many of the restaurants we recommended can also double as a great happy hour beverage stop. They include Moose’s Tooth, Bear Tooth, Humpy’s, Glacier Brewhouse, and Orso. If there’s not time to enjoy a full meal, maybe you can swing by for a drink or appetizer. Chair 5 (Girdwood) Girdwood is approximately 45 minutes south of Anchorage. This is one of our favorite spots to stop year-round… whether we are heading south to get a Christmas tree in the middle of winter or en route to a Kenai float in the “heat” of summer. Tito’s Discovery Cafe (Hope) – Hope is approximately 1.5 hours south of Anchorage. If you find yourself there for the day, then we highly recommend stopping by Tito’s. They have the best veggie wrap I have ever eaten in my life. Their burgers and soups are famous too. Service can be slow, but hey… you’re on vacation, right? Pump House (Fairbanks) – Few of our guests venture the full 7 hours north to Fairbanks, but if you do then definitely stop by the Pump House. You’ll dine in a place with truly rugged Alaskan decor and the menu always offers local options, from scallops to reindeer. There is a great selection of wine and microbrews available as well. It’s a little pricy, but worth every cent!